Texas Parent Taught Driver Education (PTDE) is a state-approved driver education program where the parent (or step-parent, grandparent, foster parent, or legal guardian) teaches their teen how to drive. Parent Taught Driver Education has the same driver education content, standards, and requirements as driver education taken through a licensed driving school or a Texas public high school. Today in Texas, Parent Taught Driver Education is a very popular alternative to commercial driving schools. The Texas PTDE Program is regulated by the Texas Department of Licensing and Regulation (TDLR). To get started, a Texas parent must register for the Texas PTDE Program on the TDLR website, and purchase the TDLR Parent Taught Driver Education Program Guide. The Program Guide outlines Parent Taught Driver Education in Texas and includes the important forms that a Texas parent or guardian must fill out and submit to a local Texas DPS Office when their teen applies for a Texas Learner License and Texas Provisional Driver License. The DPS Office will ask to review a parent’s Parent Taught Driver Education Program Guide Receipt. A teen won’t be able to get their Texas Learner License or Texas Provisional Driver License without presenting their PTDE Program Guide Receipt. In addition, a parent and teen must choose and purchase a TDLR-Approved Parent Taught Driver Education Course, like The Online Driving Professor’s Texas Teen Parent Taught Driver Education Course. Before purchasing a Parent-Taught Driver Education Program Guide from TDLR, parents or guardians are responsible for making sure that the parent or guardian does not have a criminal record or a driving record that would prevent them from teaching a parent taught course. The Texas Department of Public Safety (DPS) provides an Online Driver Record Request System for parents to verify if they are eligible to be a PTDE instructor. TDLR does not approve or deny parent driving instructors. The Texas DPS has this authority, and will check a parent or guardian’s driving record when their teen student applies for their Texas Learner License and Texas Provisional License. The parent or guardian must be at least 25 years old, have a minimum of seven (7) years of driving experience, and held a valid driver license for a minimum of 3 years. Parents can purchase the TDLR PTDE Program Guide on the TDLR Website. The Program Guide costs $20 and is emailed to parents within 24 hours. Parents should check their spam and junk folders if they do not see the Guide in their inbox after purchase. When registering on the Program Guide Order Form, a parent must enter their student’s full legal name carefully. Correcting a student’s name after registration will require written consent. After receiving the TDLR email, parents must download the Program Guide and read it over carefully. Parents must keep their PTDE Program Guide Purchase Receipt. This is a required document when a teen applies for a Texas Learner License and Texas Provisional License. A list of TDLR-approved Parent Taught Course Providers, like Online Driving Professor, can be found on the TDLR website here. A parent may begin teaching the course after receiving the TDLR PTDE Program Guide and the course material from an approved Parent Taught Course Provider, like The Online Driving Professor. What PTDE Program Guide Forms Are Needed When Applying for a Texas Learner License and Provisional License? When applying for a Texas Learner License and Texas Provisional License, a parent-instructor must present the receipt for purchase of the TDLR PTDE Program Guide. When applying for a Texas Provisional License, a parent-instructor must complete the 30 Hour Behind-the-Wheel Practice Log, found on page 11 of the PTDE Program Guide. A parent must record their teen’s 30 hours of additional adult-supervised driving of which 10 hours is driving at night. This log is a required document when applying for a Texas Provisional Driver License. Parent or guardian must register with TDLR and purchase a TDLR Parent Taught Driver Education (PTDE) Program Guide. Parent or guardian must purchase a TDLR-approved PTDE course from an approved provider, like The Online Driving Professor’s Texas Parent Taught Teen Driver Education Course. Parent or guardian assist their teen in learning and understanding the 32 hours of driver education classroom to help them receive their Driver Education Completion Certificate (DE-964) for completion of the first 6 hours of the 32 hour driver education classroom. Parent or guardian makes sure their teen passes The Official State of Texas Driving Knowledge Exam at a Texas DPS Driver License Office. Also, many approved courses, like Online Driving Professor’s Texas Parent Taught Teen Driver Education Course, offer the test online as part of the course. Parent or guardian assists their teen in applying for their Texas Learner License at a Texas DPS Driver License Office. Parent and Teen bring all the necessary documents needed to apply. A list of important documents is found on page 10 of the TDLR PTDE Program Guide. Parent or guardian continues to assist their teen in learning and completing the 32 hour driver education classroom and the 14 hours of parent taught in-car student observation and driving lessons to receive their Driver Education Completion Certificate (DE-964). Parent or guardian assists their teen in completing the required 30 hours of additional driving practice and records driving hours of the 30 Hour Driving Log found on page 11 of the TDLR PTDE Program Guide. Parent or guardian assists their teen with registering online for the IMPACT Texas Teen Drivers This two hour course is free and required for all Texas Teens to complete before applying for a Texas Provisional Driver License. A completion certificate is emailed to the student and the certificate must be presented to the Texas DPS Driver License Office as proof of completion before taking a Texas Road Skills Exam. Parent or guardian assists their teen in applying for their Texas Provisional License at a Texas DPS Driver License Office. Parent and Teen bring all the necessary documents needed to apply. The list of required documents is found on page 12 of the TDLR PTDE Program Guide. 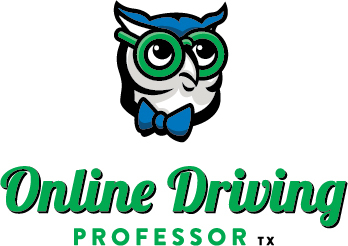 The Online Driving Professor offers the highest quality online Texas Teen Parent Taught Driver Education course. O ur students and parents rate the course highly for quality content, easy to understand, easy to navigate, cost effective, and highly flexible. You can learn driver education on your schedule and on any device – laptop, phone, and tablet. Sign-up today!